Monday--Friday, 9 A.M. to 5 P.M.
RDW Group is one of the largest independent integrated agencies in New England. We have offices in Providence, RI, Worcester, MA, Portland, ME and Boston, MA, where iFactory, our interactive communications division, is located. We are experts in creating positive change for clients in healthcare, higher education, financial services, energy, publishing, business-to-business, and nonprofit/government sectors. We are inspired by the possibilities for greater growth and renewal for our clients. From market share and brand position to external perceptions and internal transformations, our strategic skills, creative horsepower, and category experience will create, direct, and measure positive change. Our goal is not only to create a distinctive, emotional attraction for your brand but to also build meaningful relationships that breed long-term brand loyalty and return customers. We see beyond incremental outcomes and measures, and align the strategic goals and brand truth of an organization with the needs and motivations of stakeholders. We deliver truly integrated service, drawing no lines between brand, media, PR, and interactive communications. Evolve with us. From the front entrance State House -- the Rhode Island Capital -- on Smith Street travel two blocks west on Smith Street (RT 44). 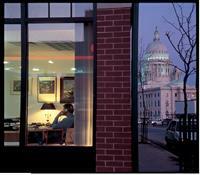 Our Providence headquarters is the first building on the right.